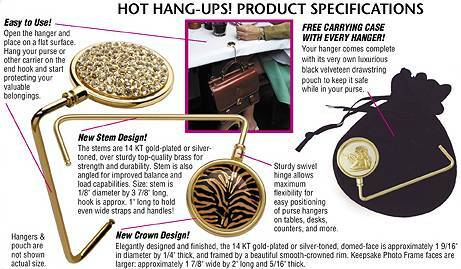 These beautiful Hot Hang-Ups!™ purse-hangers are carefully designed and expertly created by craftspeople and jewelers. 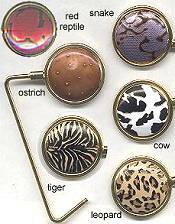 All hangers are made of high-quality, extremely durable brass, in either 14kt gold-plate or silvertone-plate finish. The face diameter is 1-1/2 inches, stem is 3-7/8 inches, angled hook is 1 inch. Face design may include cloissone, sparkling Austrian crystals, or something else dazzling! Folds easily to carry inside its velveteen pouch, keeps your handbag (or anything with a strap like umbrella, cell phone) next to you, off the floor and off the chair back. Give one to all your friends! Elegantly decorative face design of these purse hangers is made with the cloisonne enamel process. The underside of all pieces are felt-lined to protect the surface on which you hang them! Face diameter is approximately 1-1/2 inches, stem is 3-7/8, and pivots so that it can be folded flat and stored in velvet pouch inside your handbag! 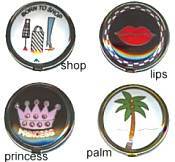 Shoe Diva is with silver metal, the others are goldtone. Elegantly decorative face design of these purse hangers is made with the cloisonne enamel process. The "Palm" and "Princess" pieces incorporate sparkling crystals. Display a favorite theme while holding your handbag/umbrella under the table, then fold away flat and store in its velvet pouch inside your handbag! 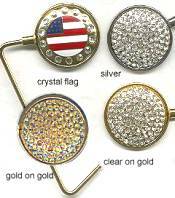 Scintillating clear Austrian crystals decorate the entire top of this purse hanger, perfect for evening and special occasions. All hangers are made of high quality, durable brass and available in luxurious 14 KT gold plate, or in a strking silver-tone plate. Face diameter is approximately 1-1/2 inches, stem is 3-7/8 long, and pivots to fold into velveteen pouch to carry in your handbag.